Boasting a large garden with water views, Oke Bay Lodge offers accommodation in Rawhiti. Paihia is 17 km from the property. Free WiFi and free private parking are provided. Haka Lodge Paihia boasts picturesque sea views and a central location, just across the road from Paihia Beach. After a day at the beach you can meet other travelers in the spacious shared lounge, or whip up a meal in the modern shared kitchen. 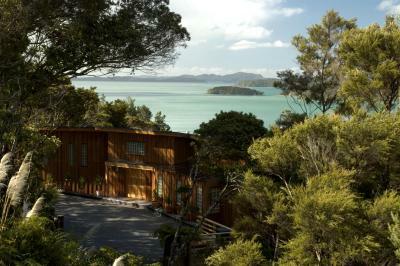 Offering a barbecue and views of the garden, Waiheke Island Punga Lodge is set in Oneroa. Cable Bay Vineyard is 1.8 km away. Free private parking is available on site. Some units have a seating area and/or terrace. Set amongst native trees on the golden sands of Sullivans Beach, just around the corner from Paihia centre, Bay of Islands Beachhouse offers luxurious apartments overlooking the beach and the islands. Base Backpackers is situated 50 metres from the beach in Paihia, the Bay of Islands. This funky hostel offers dormitory accommodation, a swimming pool and a hot tub. Just a short walk from Paihia's village centre and the wharf, Scenic Hotel Bay of Islands is a 4 star hotel offering a relaxing garden setting, great service from the friendly staff and free parking facilities. Guests enjoy free WiFi.